When we were living in Pretoria, South Africa, in the late 1980s someone brought a delicious spinach salad to a pot luck BBQ we were hosting. I made a mental note of the ingredients in the salad, but it took me a while to get the sweet and sour red dressing right. 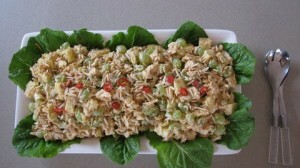 This salad is very popular as part of a buffet or to accompany a BBQ. 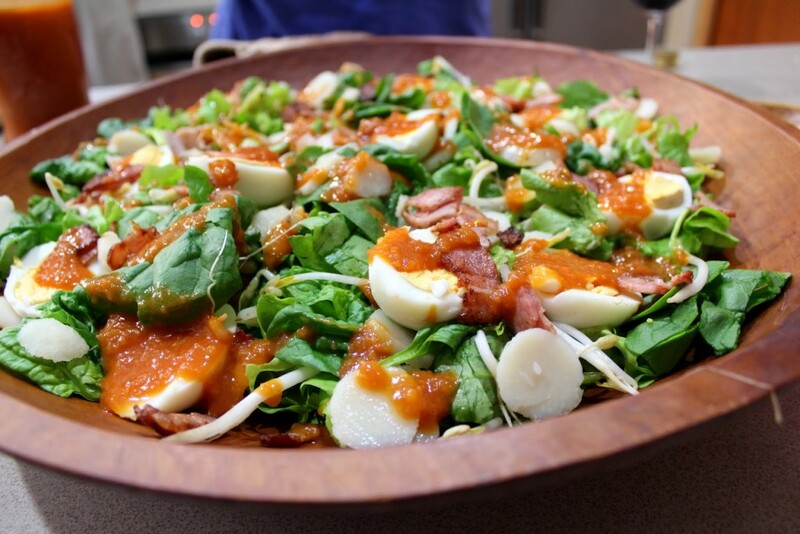 The ingredients are unusual and the contrast of the spinach and eggs with the red dressing looks good. I used to call it Sweet and Sour Dressing, but as everyone in the family called it Red Dressing, I decided to go with the flow. Serve in a large shallow bowl, so there is only one layer of each ingredient, then spoon the dressing over at the last minute and serve without mixing. The bowl in the photo is hand made and was bought at the craft market at Los Dominicos in Santiago, Chile. We lived in Santiago for 4 wonderful years and every time I return I end up bringing back a salad bowl for someone who has admired mine and asked for the spinach salad recipe. It’s a perfect size and shape for this salad. Wash and dry spinach and remove stalks. Wash and dry bean sprouts and sprinkle over. Drain and slice water chestnuts and sprinkle over. Cut eggs into halves or quarters, lengthwise and arrange over the salad. Can prepare ahead to this stage. Just before serving fry the bacon in a pan without oil until crisp, dry on paper towels and sprinkle over the salad. Vegetarians can leave out the bacon. Just before serving spoon over some Red Dressing. Process all ingredients in food processor until smooth. Keep in the fridge in a jar with a lid. Shake well before using. Goes well with any salad but especially with Spinach Salad. Over the years I’ve stopped making some of the recipes I collected in my teens because my taste has changed, or maybe they were never that special to begin with and new ones have taken over as favourites. Others have evolved over the years with slight modifications and improvements – cutting down on fat or sugar, or smartening up the presentation. This curried chicken salad, which I’ve been making for decades, falls into the latter category. When I’m asked to bring a plate and take this dish I am always asked for the recipe, so I can’t imagine I will ever cross it off my repertoire. The original version used canned pineapple, which was very popular in the UK when I was growing up. I don’t think I ate a fresh pineapple until I was well into my 20s, but everyone had a few cans in the pantry to add to coleslaw, serve with grilled ham steaks or add to fruit salads. Nobody needs to buy canned fruit these days with such a wide selection of fresh fruit available. This dish makes a perfect addition to a cold buffet and is a great way to make one roast chicken serve a crowd. It’s easy to double, triple or quadruple, any leftovers go down well the following day and I’ve also made it using leftover roast Turkey from Christmas lunch. The dressing and all the ingredients can be prepared the day before. It looks nice in individual servings, piled onto a large lettuce leaf or in a whisky tumbler lined with lettuce. If you want to be really swish, serve the salad in hollowed out fresh pineapple halves, with the green tufty bits left on and of course use what you’ve dug out in the salad. Garnishing with red chilli brings this dish into the 21st century. Dressing: Chop chutney if it’s very chunky. Mix all ingredients together and refrigerate for several hours or overnight. Toast almonds or cashews in a dry frying pan, stirring frequently, until golden, then remove from pan and cool. Prepare the chicken, grapes, celery and pineapple and refrigerate each separately. Recipe can be prepared to this stage up to 24 hours before serving. If you have time, mix chicken with dressing and refrigerate for a couple of hours for flavours to blend. Mix in celery, grapes and pineapple just before serving. To serve, mound the salad onto a flat serving platter with lettuce leaves around the edge. Or omit the lettuce and pile the salad into a serving bowl. Sprinkle with toasted nuts and garnish with the chilli. Serves 6 as a main course or at least 12 as part of a buffet. 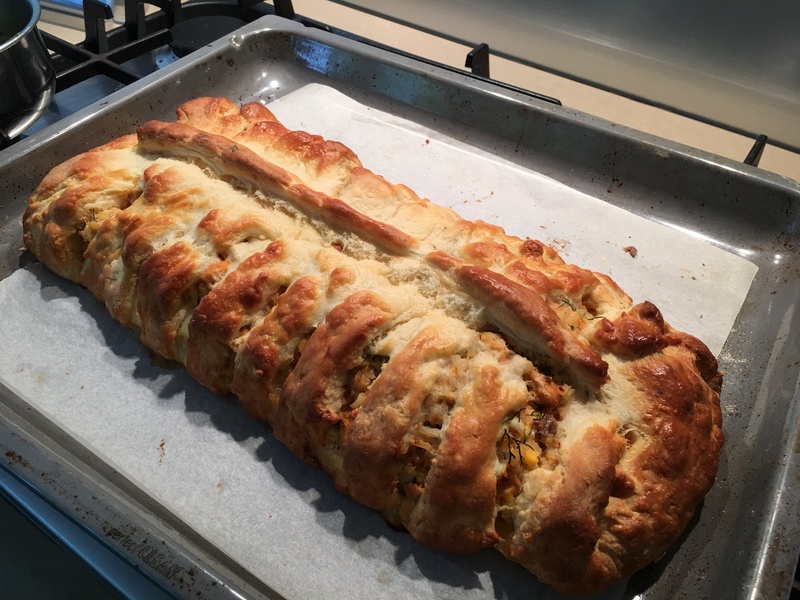 I learned how to make this Finnish Salmon Pie at a cooking demonstration given by a Finnish diplomat’s wife over 20 years ago. Back then fresh salmon was not so readily available and everyone used tins. In fact I don’t think I tasted fresh salmon until I was in my twenties! The original recipe used two large tins of salmon. I now make it using a combination of fresh and tinned, which I think gives a good result. The butter and dill sauce is an optional addition. Not on the agenda if you’re watching cholesterol levels, but quite delicious. The cucumber salad is a perfect accompaniment. If you’re not sure what a Swiss roll tin looks like have a look at these images on Google. Mine is about 25x30cm. If your tin is bigger just roll out the pastry to about this size. Pastry: Place flour and butter in food processor and process until it forms crumbs. Add cottage cheese and process. As soon as the pastry starts to stick together add just enough water so that it forms into a ball. Stop motor immediately, tip out, wrap in plastic wrap and chill while you prepare the filling. Filling: Cook rice and eggs together in boiling water to cover for 10 minutes. Tip into a sieve and allow the rice to drain. Put the eggs back in the pan, cover with cold water and leave until cool enough to handle, then peel. Remove skin and any bones from fresh salmon, then cut into 1-2cm dice. Place in a bowl with the canned salmon (discard skin and bones), the rice, dill and hard-boiled eggs, roughly chopped. Mix well and season to taste. Place a piece of baking paper on a Swiss roll tin – not essential but makes washing up easier. On a floured surface roll out pastry to the size of the Swiss roll tin, then place on the baking paper, folding it to make it easier to move. It doesn’t matter if the edges are ragged, you won’t see them once the pie is finished. Place salmon filling down centre in the shape of a log or loaf and covering about a third of the pastry surface. 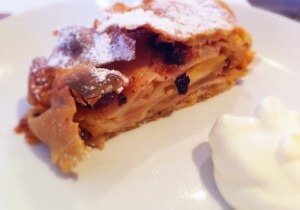 Cut diagonal slits in pastry every 2cm down each side, from the edge of the pastry as far as the filling. Fold in the two ends, then bring up strips from alternate sides, overlapping them slightly, to form a pseudo-plait. Use your hands to push everything firmly into place. Can be refrigerated at this stage if you like. Paint with beaten egg and bake for 30-40 minutes at 200°C. Serve warm, cut into slices and drizzled with the sauce. Sauce: Melt butter and mix with chopped dill. Variations: use white fish and canned tuna instead of the salmon. Peel onion, cut in half and slice thinly. Slice unpeeled cucumbers thinly and mix with onions. The quickest way to do this is with the slicing blade of a food processor. Mix vinegar, water, salt and sugar. Pour over onions and cucumbers, mix well and leave for 1-2 hours at room temperature, mixing from time to time. Drain cucumbers and onion in a colander or large sieve. Discard the juices. Put the colander in a bowl, so it continues to drain, then put it in the fridge, covered and leave it there draining till serving time. In a small bowl, mix sour cream, mustard, fresh dill and pepper to taste and refrigerate till serving time. 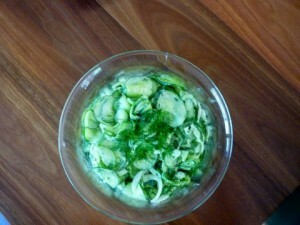 To serve, mix well-drained cucumbers and onions with the sour cream dressing. Garnish with sprigs of dill. This salad goes well with most fish dishes, especially salmon. It’s also a good addition to a buffet or BBQ. Last week my friend Ferne asked me what we were having for Christmas lunch. I said we were having a cold buffet and mentioned a recipe for roast beef with a fresh herb dressing that I was thinking of doing from an old Women’s Weekly cookbook. It’s perfect for a summer buffet. I haven’t made it for quite some time but said I would dig it out. Ferne said if you find it, please send it to me. I have about 30 Women’s Weekly cookbooks – they were all the rage in the 70s and 80s – and typically it was in the last one I opened, called Celebration Cookbook. Here is my slightly adapted version. Preheat oven to 180°C. Trim beef, tie into a neat shape with string. Roll in peppercorns and press them in. Heat butter and oil in a roasting pan. Add beef and cook briefly all over until sealed. Place beef in the oven and bake for about 25-30 minutes for medium-rare, or until cooked to liking. A meat thermometer is useful for getting it right and should read 55°C for medium-rare. Remove from the oven, cool to room temperature, remove string. Slice beef thinly and arrange on serving dish in overlapping rows. Top with dressing, garnish with parsley leaves. Serve remaining dressing separately. Dressing: Place all ingredients in a jam jar with a lid and shake vigorously. Serves 10-12 as part of a buffet. Note: Beef can be cooked and dressing made the day before serving. Store both in the fridge well covered. A terrine is handy to have in the fridge over the holiday period. Serve as a light lunch or starter with salad, or as part of a buffet. My terrine dish is made from glazed pottery and holds 3 liters. It has a lid and was made in France. A metal or silicone loaf pan will do. You can use pink peppercorns in brine or the dry ones which I buy from The Essential Ingredient. I’ve put “About 700g of chicken mince” because if you buy it prepacked and it happens to be 100g more or less, it doesn’t matter, throw it all in. Same with the breasts. When you tip it out there will be a certain amount of jelly surrounding the terrine. You will probably want to throw this away, although our golden retriever thought it was quite delicious mixed in with his boring dry biscuits for dinner! Preheat oven to 200°C. Lightly oil the terrine dish, then line it on all sides with a single layer of pancetta or prosciutto. Trim chicken breasts of any fat, then cut into 2-3cm cubes. Use your food processor to chop the herbs and mix with the chicken breast, stirring to coat thoroughly and adding salt and pepper to taste. Mix chicken mince with remaining ingredients, using food processor to chop the onion or shallots. When thoroughly mixed place half the mixture in the terrine, spreading evenly, then arrange all of the chicken breast cubes on top, then the rest of the mince mixture. Press down well, cover terrine with the lid or with a piece of foil. Place in a large dish such as a lasagne dish or a baking pan and pour in enough boiling water to come halfway up the sides of the terrine dish. Bake for an hour, then remove from the oven, cool thoroughly, then refrigerate overnight. Some terrines need to be weighted overnight, but I found this didn’t need it. To serve, loosen the terrine and tip out, then cut into slices. If it’s difficult to remove, you might need to dip the bottom of the terrine into boiling water. 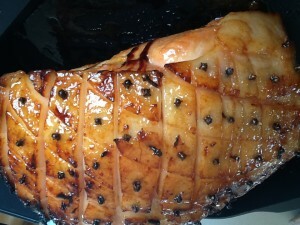 If liked, garnish with some extra pink peppercorns and serve with Sweet Mustard Sauce. Cuts into about 10 thick slices. Place all ingredients in a jar with a lid and shake well. Leave overnight for the sugar to dissolve. Note: this mustard sauce goes very well with Gravlax for which I would add a couple of tablespoons of finely chopped dill and 3-4 Tbs mayonnaise (preferably home-made) to make the sauce less hot.